My name is Matt Winick from Ann Arbor, Michigan with a strong interest in learning history and social justice. In these subjects, I like to learn the need to make Civil Right stronger to reduce discrimination, protect the environment from pollution, and have criminal justice reform to help protect people’s rights while reduce crime. 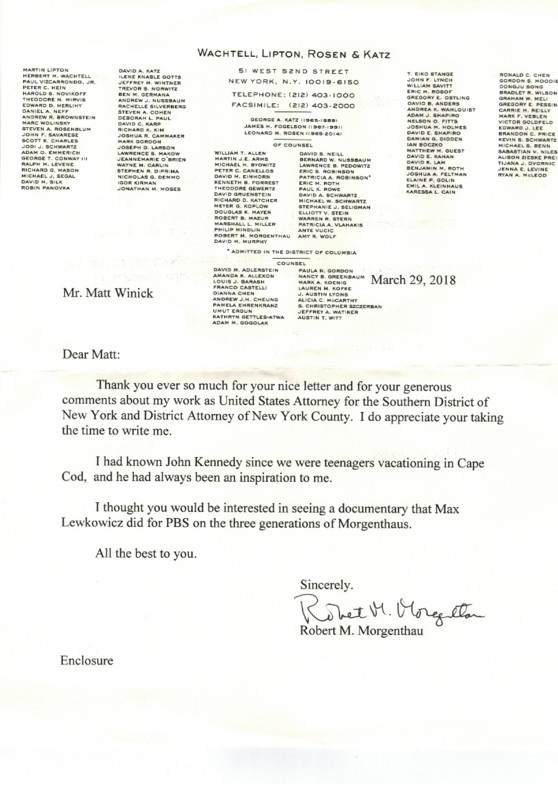 Honorable Morgenthau, the main reason I’m writing you a letter is to explain how I find your work as U.S. Attorney for the Southern District of New York and as New York County District Attorney to be very inspiring to me. In 1962, I liked on how you accepted President JFK to serve as U.S. Attorney for the Southern District of New York to help him improve our country. When you served as U.S. Attorney for the Southern District of New York from 1962-1970, I liked on how you were a strong supporter of Civil Rights by advocating for people with disabilities’ rights, prosecuting people who commit hate-crime to help protect minorities including people who are different, and investigating public places that practice discrimination. Another thing that I liked about your work as U.S. Attorney was how you prosecuted industries that polluted the environment including water resources to help protect people’s health while protect the environment, investigated, established a unit to investigate securities frauds that financial institutions did, and went after public officials who accepted illegal bribes or are corrupted. When you served as New York County District Attorney from 1975-2009, I liked on how you continue to be a strong supporter of Civil Rights, improve units to help investigate public official who were corrupted, and many others. Another thing that I liked about your role as New York County D.A. was how you advocated for criminal justice reform like expand drug treatment programs to help drug users get the care they need to reduce drug addiction, support programs to help victims of crime or victims of domestic violence get help on dealing with their trauma, and many others. 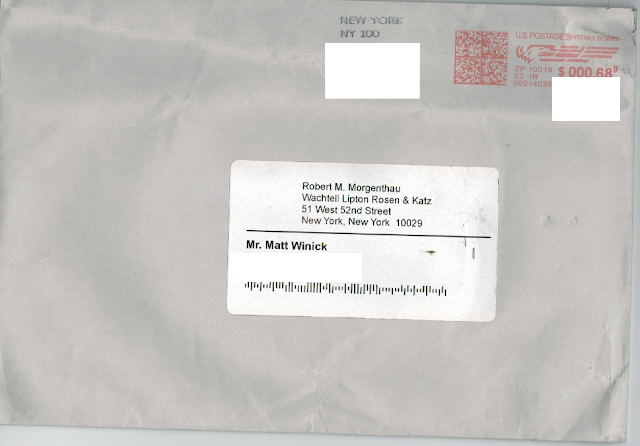 Honorable Morgenthau, I have autism with a learning disability. Having a disability is hard for me because I have trouble comprehending on learning different advance subjects, sometimes I struggle to communicate my thoughts, and get teased. Your commitment to be a strong supporter of Civil Rights including people with disabilities’ rights really inspires me to work hard on my disability. Also your role as U.S. Attorney for the Southern District of New York and New York County District Attorney gives me motivation to continue to learn history and social justice. My future goal is to someday work in these areas is to emphasize the need to make Civil Rights stronger to reduce discrimination, have criminal justice reform to help protect people’s rights while reduce crime, and have ethics reform to reduce corruption. Also recently, I visit the LBJ Presidential Museum/Library in Austin, Texas where I enjoyed learning about his life including the presidency, his work on Civil Rights, and I saw some information about your role on helping LBJ with his Civil Rights causes. I strongly believe that you made a great difference for our country and the judicial system. I’m very proud on how you worked hard to help President JFK and LBJ to help our country on Civil Rights and many other issues. You have truly inspired me to work hard on my disability and to be motivated to continue to learn different subjects like history. I was wondering if you could please explain what it was like working with President JFK and LBJ. Thanks for taking the time to read my letter, making a great difference for our country, and inspiring me. I wish you the best to continue to advocate for common sense ideas.